I have a neighbour whose drains empty into my drainage system. The drains were put in 50 years ago when my house was built. Recently my garden has turned into an evil-smelling quagmire. My neighbour put a CCTV camera down his drains and found no blockage or damaged pipes, but where his system joins my system we saw that the pipe had become misaligned, so that only half the output goes down the drain; the rest bubbles up in my lawn. I say it’s his waste, so he should pay for it. He says the fault is under my land, so I should pay for it. It’s July 23, 1984. 04:44 in the morning. A thin beam of light slowly traverses the shelves. It stops, and scans back. It comes to rest on a particular book. A nod is exchanged. A gloved hand silently plucks the book from the shelf. It disappears into a sack. Not even the cat wakes up as the intruders slither out of the window and slide back down the drain pipe. The previous day you had strolled into Dillons and treated yourself to a book. But unfortunately for the venerable bookseller, they weren’t supposed to be selling that particular edition. It was produced for another market. You didn’t know that, and what’s more you didn’t really care. But Dillons cared. That’s why they had to get it back. And they did. You woke up the following morning to find your new book had mysteriously disappeared. Improbable? Certainly. Impossible? Not entirely. Fast forward 25 years to 2009. You’ve just bought your spiffy new Kindle from Amazon, and having got this shiny new piece of kit, you might as well buy an e-book to read on it. So you make your selection from the Amazon store, and you pay Amazon your money, and you download your book. You wake up the following morning to find your new book has mysteriously disappeared. Improbable? Not at all. Impossible? Certainly not. So what’s happened? Well, Amazon was selling an e-book they weren’t supposed to be selling, so they simply deleted it from the Kindles of everyone who bought it. I can tell you this: I wouldn’t be happy to cede control of my library to Amazon or any other supplier. It’s Big Brother and the Ministry of Truth, 1984 all over again. We are no longer allowed freedom of choice, merely the illusion of it. By now you can probably guess the book that Amazon deleted. With superb irony, it was indeed George Orwell’s Nineteen Eighty Four. Seemed good to me. I’d never heard of the beer, but the label looked expensive, so I grabbed three. If I didn’t like it, it was only four quid. After I left the checkout, something was nagging at me. Normally I push a loaded trolley to the till and mentally prepare myself for the three figure shock, but this was a small shop and yet the bill was still rather more than I’d assumed. Not till I got home did I check the till receipt. The three bottles of beer for £4 had been charged at £9.78. I must have made a mistake, I must have misread the offer, because surely Sainsbury’s would have automatically deducted the special offer. They wouldn’t have cheated me? Would they? 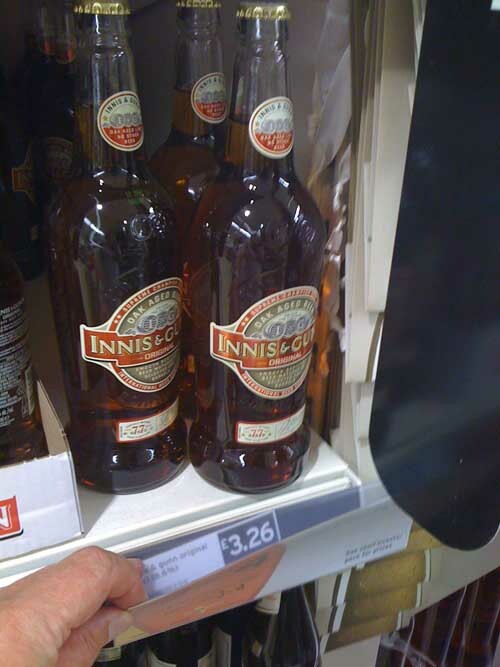 Hidden behind the Special Offer tag was the actual price per bottle, a massive £3.26 for a bottle of beer. Wow. 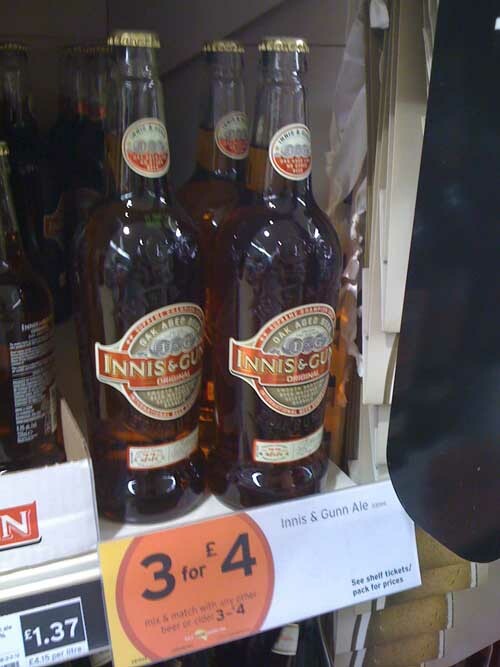 The special offer referred to the smaller bottles of Innis & Gunn on the left. I felt their signage was misleading, so I took these snaps on my iPhone and went to the customer service desk. The girl agreed immediately and refunded the cost of two of the bottles of beer. Well done to Sainsbury’s for making good immediately. Fewer marks for their confusing signing. I wonder how many other customers bothered to schlep back and complain? By the way, the beer was OK. Nothing to blog about. I use less than half of my monthly mobile phone call allowance because I’m a surly old git who doesn’t ring people, so I was surprised to see an extra £4.11 for ‘calls’ slapped on to the bill. After I got through to a human voice (7″ 56′) I was told the charge was for calls to 0800 numbers. “But 0800 numbers are free!” I protested. “Not from a mobile”, she answered. “Where can I find these charges on your web site?” I asked. This information is nowhere to be found on the O2 website. It’s a covert operation. No wonder we’re led through a maze of number punching and voicemail options before we are allowed to ask a question. I reckon on an average of 5 minutes after I first dial goes by before I am permitted to speak to a customer advisor. That’s a quid a call, just to O2, on top of the cost charged by the company I’m calling. More, in many cases.